For the last post in this year’s Get to Know GMOs series, we invite you to come with us for an eerie stroll through some of the Internet’s most outrageous GMO myths and images. 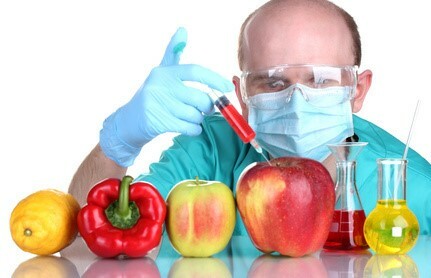 Myth #1: Evil GMO scientists are injecting GMO crops with pesticides, DNA, dangerous chemicals…or stuff. Using needles to inject crops with “stuff” is not how GMOs are made. How are they created, then? Some GMOs are made by taking a desired trait, like disease resistance, from one plant or organism and transferring it to the plant we want to improve. Others are made by helping plants use a natural process to adjust a gene expression within a plant. This can help plants protect themselves from certain viruses and pests. Learn more about this process in detail here. These modifications are done at the genetic level, with changes made to the DNA of a plant before it ever becomes a seed or a crop. Want to learn more about how GMOs are made? This video explains the process in detail, using the Hawaiian Rainbow papaya as an example. 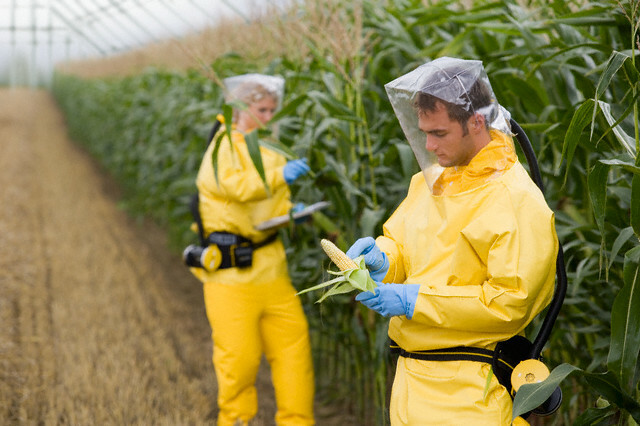 Myth #2: GMOs are so dangerous that farmers have to wear hazmat suits to grow them. He continues to explain that for most crop protection products used by farmers (both organic and conventional) it’s typically recommended that the applicator wears normal cotton clothing (long sleeved top and pants), gloves and boots – just like you would wear for any lawn care applications. However, farmers do not wear hazmat suits or the painter’s smocks made famous by recent documentaries to plant seeds, work in or manage their fields. 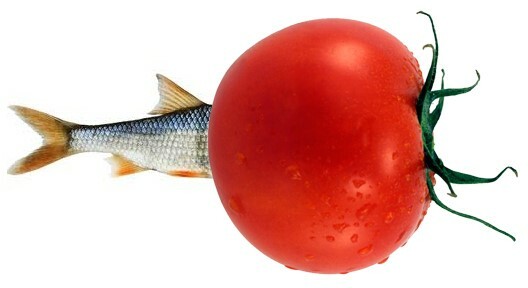 Myth #3: There’s something fishy about those GMO tomatoes. Why is “animal genes” in quotes? Because in the end, there really aren’t animal genes or plant genes, there is just DNA. DNA from any source is made up of the same four basic nucleotide building blocks: adenine (A), cytosine (C), thymine (T) and guanine (G), and it’s estimated that 60 percent of the genes in plants have very similar copies in animals. Did you know: You share 50 percent of your genes with bananas? 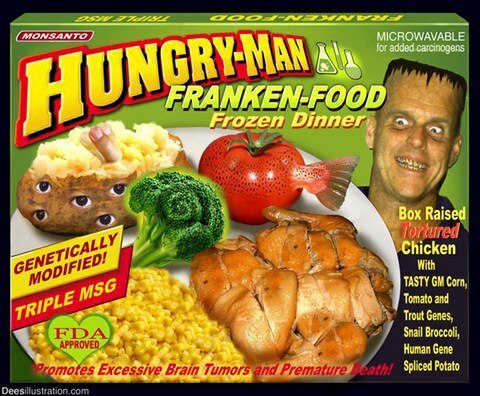 believe that GMOs are created by haphazardly “forcing” foreign, unnatural animal and plant genes together. This couldn’t be further from the truth. “For context, it is important to recognize that random genome insertions have been naturally occurring in crops over the ~10,000-year history of agriculture. In some crops, more than 90 percent of the genome consists of these types of random insertions.” Dave Kovalic, Regulatory New Technology Lead, Monsanto Company, continues that, “unlike new crop varieties developed by other breeding methods, researchers fully characterize GM crops at the molecular level.” Read his full post for a more technical explanation. Did you know: GMOs are more natural than you may think, Mother Nature has been “stitching” together new varieties for thousands of years. Myth #5: Is the new GMO apple a trick or treat? There’s a new GMO apple coming to market, and despite everything you might read or see online, it doesn’t have teeth added or a tongue hiding it – in fact, it doesn’t have anything added to it at all. The two GMO apple varieties, Arctic® Granny and Arctic® Golden were created using a natural process that adjusts how certain genes are expressed. The genes that are affected by this process in this apple keep the Arctic® Apple from turning brown when sliced (which incidentally helps reduce food waste). No genes are added or “inserted” into the Arctic® apple varieties. 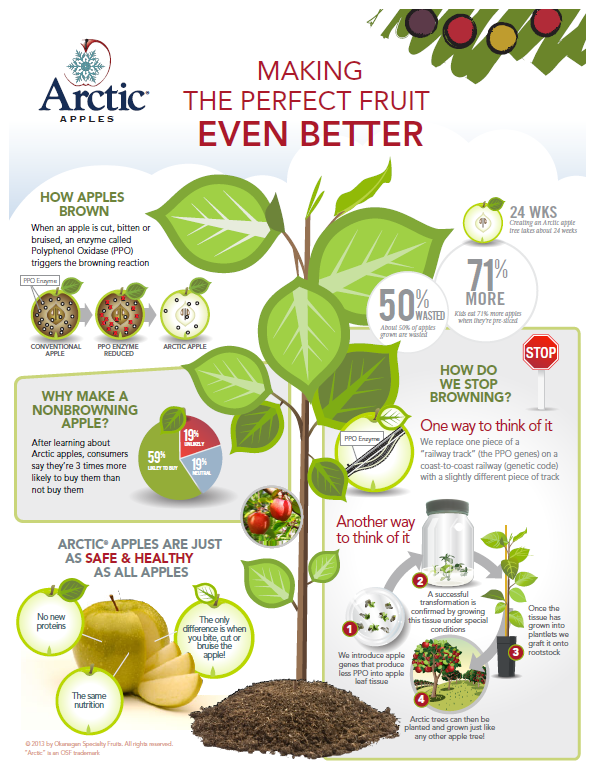 So how do the Arctic® apples work? The creators of Arctic® apples explain that there are two things which create browningin apples – PPOs and polyphenolics. When you cut or bite an apple, those two things react, and browning occurs. Using RNAi (a type of gene regulation that Steve Savage explains in this post on GMO Answers), Arctic® apples produce practically no PPOs so that enzymatic browning reaction never occurs. Voila! Non-browning apples. We say voila! But these apples took more than 15 years to bring to market, and still aren’t quite there yet. Currently, Arctic® apples have been approved and will be available for purchase soon. Find out more about the Arctic® apples from Neal Carter, the president and founder of the Okanagan Specialty Fruits, which is the company that developed the Arctic® apples. Looking for more information? Check out the following links! Popular Science debunks 10 common claims in this post. NPR’s The Salt also “busts” their top 5 GMO seed myths in this post. If you have additional questions, feel free to search our archives or submit a new question. Continue to check out the site for more information to help you get to know GMOs and #100DaysofGMOS!